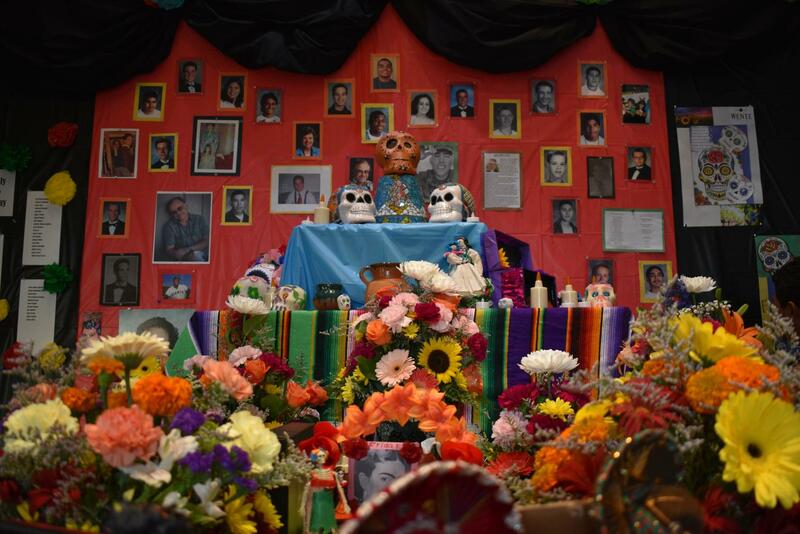 On November 1, West High students celebrated Día de los Muertos, a Mexican holiday that spans two days, celebrates and remembers loved ones who have passed away. AP/Fine Arts teacher Mr. Alex Nelson was the main coordinator of the art show. A range of students participated in bringing this event together. The floriculture class assembled beautiful bouquets that surrounded the altar and sent a pleasing scent in the display room. The Spanish and Fine Arts classes decorated the walls with skulls of their personal design and mini altars dedicated to influential Spanish singers, celebrities and artists were scattered about. The Spanish Club, Art Club, M.E.C.h.A and Cafecito Moms were also a part of the effort to make this Día de los Muertos event better than the last. Face painting and food provided by La Esperanza were new additions to the event. Music was played as students and families talked over tacos and sweets. The Día de los Muertos event not only provided a place for West to remember late loved ones, but brought students from different areas of the school together. With collaboration, creativity and teamwork the Días de los Muertos event can be seen as an example of what West is capable of when working together to celebrate a cultural festivity such as this.